Tuscan Pleasures I shows a glorious Tuscan scene of flowers in the Tuscan landscape. Here we see yellow sunflowers and red poppies decorating the landscape as the path winds towards the distance where hills and mountains are hunted at disappearing into the clouds. The balance of color is beautiful as we see the warm yellows and reds contrasting with the greens and blue violets. 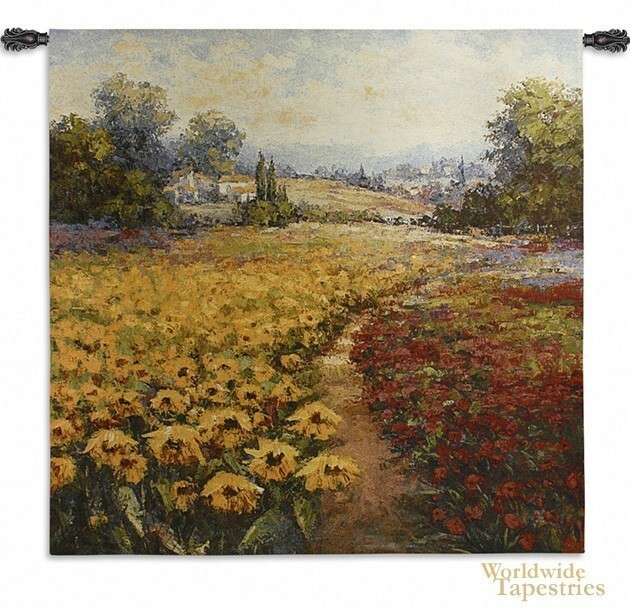 Tuscan Pleasures I tapestry is backed with lining and tunnel for easy hanging. Note: tapestry rod, where pictured, are not included in the price.